Dr. Smith received his undergraduate degree from the University of Illinois at Urbana Champaign in 1984. He received his Doctorate of Dental Surgery from the University of Illinois College of Dentistry in Chicago in 1988. He completed postgraduate training in the General Practice Residency Program at Tufts University in Boston in 1989. In 1993, Dr. Smith began his private practice on Humphrey Street in Swampscott. He moved his practice to Puritan Rd. in 2007 and expanded his practice in 2016. 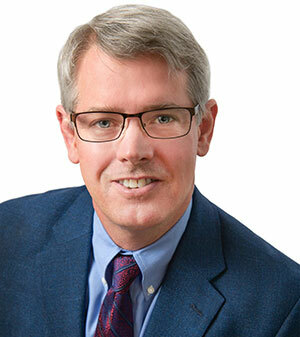 Dr. Smith is a member of the American Dental Association, the Massachusetts Dental Society, the North Shore Periodontal Prosthesis Study Club, and the Academy of Computerized Dentistry. He has been editor and Chairman of the North Shore Dental Society Newsletter for six years and has lectured to his study club. He is also a member and past president of the Swampscott Rotary Club. He has continued to keep his practice current with continuing education with Spear Study Club and Seminars. Dr. Smith and his wife Janice are the parents of two boys, Tyler and Jake. He enjoys biking, hiking, skiing, and ocean kayaking.